GoBites -healthy energy for your adventures. Packing for an outdoor adventure can be a challenge. Buying comfortable shoes, durable clothes and the right gear is necessary, but what about food to help get you through the day? The best foods are lightweight, nonperishable, packed with nutrients and easy to prepare. GoBites, a portion-controlled, all-natural snack delivery service (most products under 200 calories) offers more than 25 varieties, sent directly to one’s home is the perfect addition to a backpack. 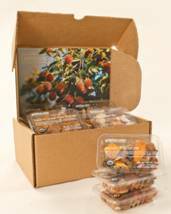 Packed with nutrients and proteins, GoBites packs of nuts and fruits can be delivered on weekly, bi-monthly or monthly basis (in packages of 14; subscriptions start at $27.86). The grab-and-go packages can be customized by dietary needs (Diabetic, Gluten Free, Paleo, Heart Healthy, etc.) and includes a variety of exotic ingredients (organic cavendish bananas, Sri Lankan jack fruit, white figs, mulberries, monukka raisins, Balinese cacao nibs, rambutan and more). Using only Mother Nature’s finest ingredients, GoBites is the perfect snack pack for the adventure enthusiast. Excitement is building for the TrailLink app, which was recently featured on the TODAY show. You can download the app from the iTunes store beginning November 15; an Android version will follow in early 2014. The app includes all the great TrailLink.com features you know and love—interactive maps, tons of photos, firsthand reviews, and detailed trail facts—plus downloadable maps for offline use and the ability to see your location on the trail.